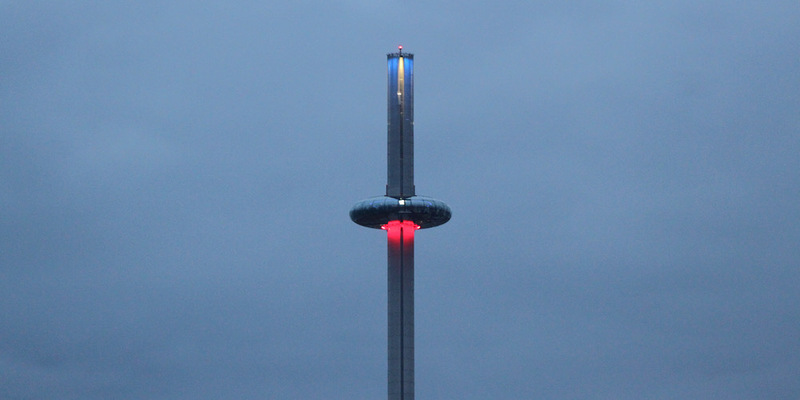 Brighton beach has a cool claim to fame - British Airways i360. 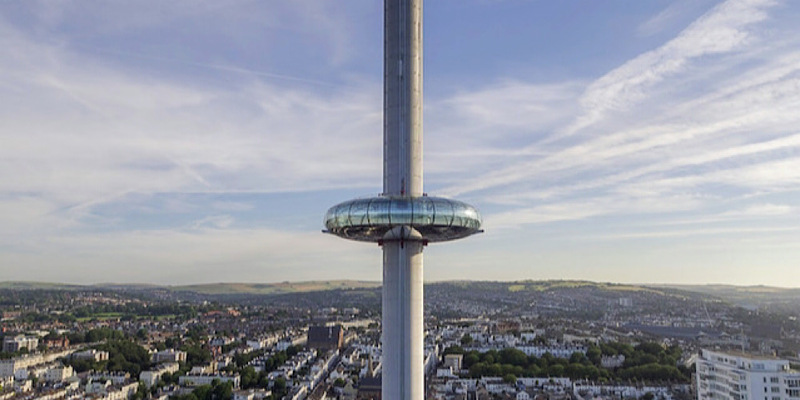 The new attraction is the world's world’s tallest moving observation tower, giving passengers a bird's-eye view of all of Brighton and a whopping 26 mile view of the south coast. This article brought to you by British Airways by providing complimentary access. Affiliate links included. See disclosure for more. The designers of the London Eye have created this modern ride with the same careful sleek and svelte style. 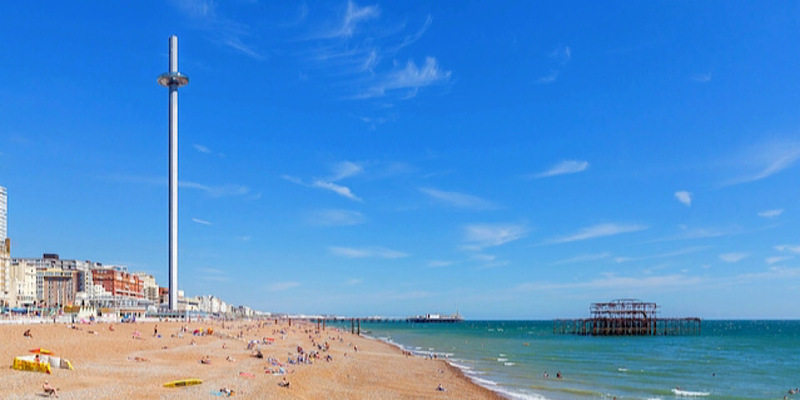 While Brighton is known for its famous Palace Pier, as well as its infamous West Pier, both extending out into the ocean for shoreline views, this time the newest pier is a vertical one, extending straight up into the sky for 360 degree views from above. You can see clear to the South Downs National Park, out to the Isle of Wight, and even the massive Rampion offshore wind farm scattered out in the water. To get onboard, you step into a giant round glass pod (10 times bigger than the London Eye pods). From the ground, the pod appears tiny, but inside it's huge! It actually can hold up to 200 passengers per flight, with both seating and standing areas. The ultra futuristic curved glass and contemporary industrial beams feel like a scene right out of the Jetsons! Spacely Sprockets, here I come! 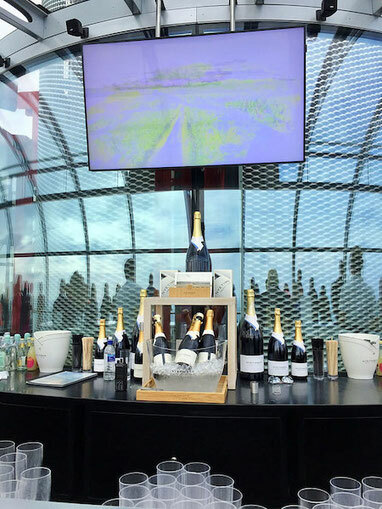 The viewing pod even has it's very own, very unique Sky Bar onboard where you can sip on some locally made sparkling wine from Nyetimber. It's deliciously crisp, subtle yet sweet, and the perfect elegant refreshment to accompany the view. Some golden liquid courage while flying up into the sky! As you're enjoying the view (and the drinks) you won't even notice as the pod begins to ascend. I was a good third of the way up before I even looked out and realized we were moving at all. Just an easy, gentle glide into the sky and a total visual feast your eyes in every direction you look. The flight is also energy efficient, utilizing innovative green energy as it self-generates half of its ascent energy on its descent, with the remainder of its energy use all derived from renewable sources. 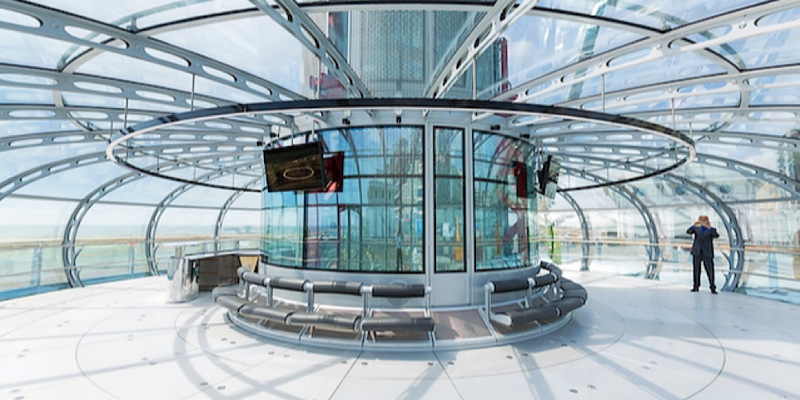 The viewing pod soars upwards and hovers at a staggering height at 138 meters (or 450 feet!) then descends back down just as seamlessly as it started. Even if you have a fear of heights, you can easily do this. It's a calm ride that didn't even phase the toddlers aboard. The surrounding seagulls don't even seem to mind it as you watch them flying around from above instead of below. 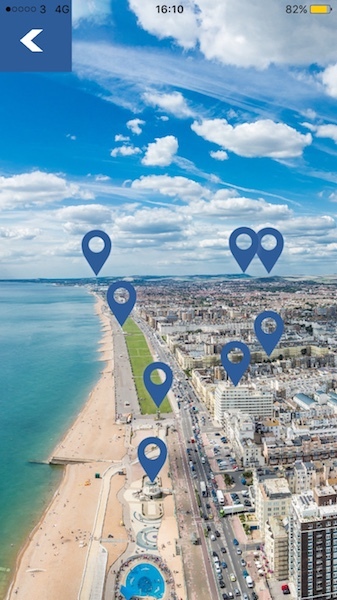 While in the air, you can use the handy app to locate and identify local landmarks. Hovering over any icon will pop open a box with more information. The app also comes with more details about the back story of tower and the pod, and a fun treasure hunt for kids to play. Have some cocktails, have a cuppa in the restored Victorian tollbooth turned West Pier Tea Room, get a bite to eat at The Belle Vue Brighton restaurant, check out some local souvenirs in the gift shop, and stroll through a gallery exhibit to learn more about how the tower was created, built, and constructed and you can even see the awesome cable system working below ground. When you're done exploring, you exit right onto the beach so you can enjoy the equally beautiful sea-level views as the eerily beautiful derelict West Pier punctuates the horizon just ahead. 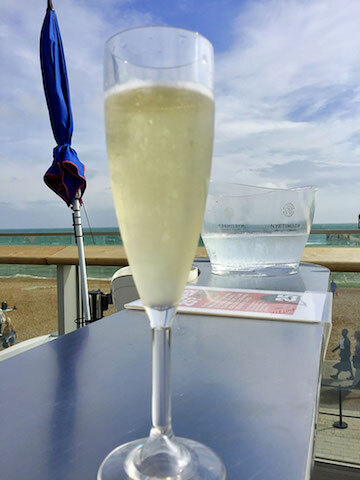 British Airways i360 is an easy 15 minute walk from Brighton train station, and a half hour train ride from Gatwick Airport or about an hour from other London stations. 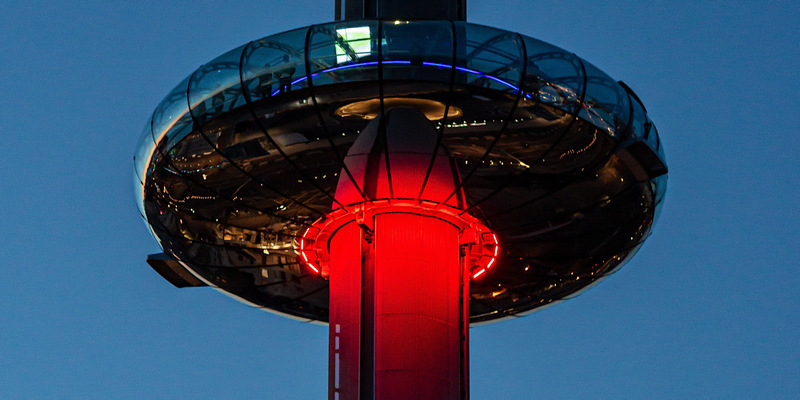 Head to British Airways i360 to book your flight online and get a special discount price. Flights can be booked up to 4 weeks in advance and depart in 30 minute intervals daily. Arrive a bit early to go through a security check before your scheduled flight. If you're a photo lover, you can pose for a photo with your friends to purchase after. There's much to see and do so I'd recommending planning 1-2 hours to take it all in, especially if you're drinking and dining after in the Beach Building. 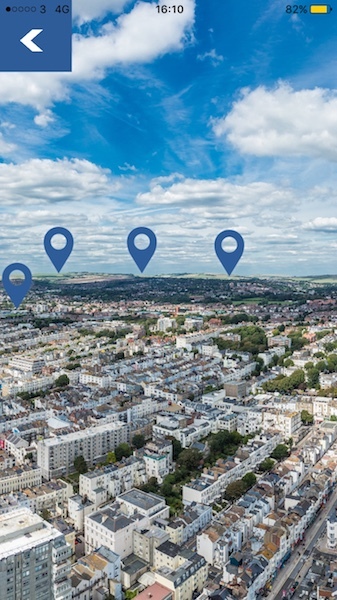 And then wander on and go discover more of lovely Brighton!